Q: On the evening of August 21, the US President Donald Trump delivered a speech to elaborate on the new US strategy towards Afghanistan and South Asia, which aroused wide attention from various parties. Against such backdrop, will China consider adjusting its policy towards Afghanistan? A: Just as you mentioned, the new US strategy towards Afghanistan and South Asia expounded by President Donald Trump in his speech has attracted wide attention from various parties. Yesterday, when having a telephone conversation with the US Secretary of State Rex Tillerson, State Councilor Yang Jiechi stated China's policy towards Afghanistan. The Chinese side is actively committed to promoting the peace and reconciliation process in Afghanistan. We always maintain that political dialogue is the only way out for resolving the Afghanistan issue. The international community should support the "Afghan-led" and "Afghan-owned" reconciliation process, support Afghanistan in realizing the widespread and inclusive political reconciliation, support the Afghan people in exploring a development path suiting their own national conditions and support the Afghan government in enhancing counter-terrorism capability and combating extreme terrorist forces. We need to attach importance to the important role of Pakistan in the Afghanistan issue and respect the sovereignty and legitimate security concerns of Pakistan. The Chinese side is willing to maintain communication and coordination with the United States on the Afghanistan issue and make concerted efforts for achieving the peace and stability of Afghanistan and the region at large. Q: Yesterday, Pakistan's Foreign Secretary Tehmina Janjua concluded a 3-day visit to China. And during her visit, she met with Foreign Minister Wang Yi and other officials. Could you give us some detailed information? A: In recent days, Pakistan's Foreign Secretary Tehmina Janjua visited China. State Councilor Yang Jiechi, Foreign Minister Wang Yi and Assistant Foreign Minister Kong Xuanyou met with her respectively. The relevant press release has been issued. The Chinese side said that China and Pakistan are all-weather strategic cooperative partners and the two sides always firmly support each other on the issues concerning each other's core interests. Against the backdrop of the complex and volatile international and regional situations, the strategic significance of the China-Pakistan relations has become more prominent. The Chinese side appreciates the efforts made by Pakistan to fight terrorism and safeguard the security of the China-Pakistan Economic Corridor and is willing to strengthen all-round cooperation with Pakistan so as to achieve common development. Foreign Secretary Tehmina Janjua said that China and Pakistan enjoy ironclad friendship and no matter how the political situation changes in Pakistan, its friendly policy towards China remains unchanged. The Pakistani side will as always firmly stand together with China on the issues concerning China's core interests and join hands with China to advance the building of the China-Pakistan Economic Corridor and continuously move forward the bilateral relations. Q: According to the report of the Hindustan Times, recently, India's Union Ministry of Home Affairs (MHA) has cleared a proposal to construct a road from Marsimik La to Hot Spring. Marsimik La is only 20 kilometers away from the northwestern tip of the Pangong Lake. The Indian media said that the road will give Indian security forces in the remote regions the access to the disputed areas of the China-India boundary so as to "ensure the strength of the Indian border troops". What is your comment? A: This report makes me feel that India is slapping its own face. The Chinese side constructs roads on its own territory, but India illegally crossed the boundary to obstruct that under the so-called pretext of "security concerns". Now the actions of India exactly prove that on the relevant issues concerning the China-India boundary, India's deeds cannot match its words and what it did is inconsistent and contradicts with what it said. The western sector of the China-India boundary has not been delimited. 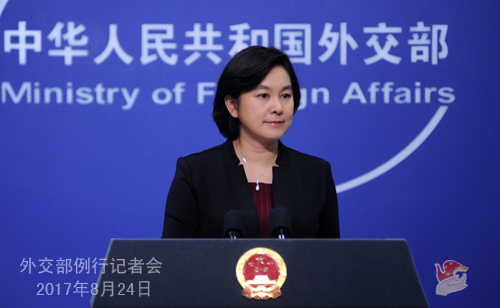 China and India have agreed that pending the final settlement of the boundary issue, they will make concerted efforts to uphold the peace and tranquility of the border area. India's construction of the infrastructure which is obviously for the military purpose near the Line of Actual Control in the western sector cannot help to uphold the peace and stability of the western sector of the China-India boundary or ease the current situation of the boundary between the two countries. Q: In Xi Jinping's congratulatory message to the ROK President Moon Jae-in, he said that China would make concerted efforts with the ROK to properly address the differences between the two countries. Is it an olive branch to the ROK from China? Is China willing to be more receptive in listening to the ROK's explanation as to why it wants to deploy THAAD? A: In accordance with the practice, President Xi Jinping and President Moon Jae-in sent messages of congratulation to each other on the occasion of the 25th anniversary of the establishment of the China-ROK relations on August 24. During the past 25 years since the establishment of the China-ROK ties, a lot of fruits have been reaped, which has delivered tangible benefits to the two peoples. These outcomes are worth cherishing. Under the current circumstances, we hope the ROK can review and take stock of the experiences and lessons in the past 25 years, take seriously China's major concerns, take constructive measures to properly handle relevant sensitive issues and promote the improvement and growth of the China-ROK relations. China's position on opposing the deployment of THAAD is quite clear-cut, firm and consistent and it remains unchanged. Q: It is reported that a Japanese historian, Kuboi Norio, recently released a part of the historical map of Japan, which confirmed that Diaoyu Dao is an inherent part of the Chinese territory. He also said that the historical map on the official website of Japan's Ministry of Foreign Affairs is forged. What is your comment? A: I have noted the relevant report. I would like to stress that Diaoyu Dao and its affiliated islands are inherent territories of China. China's sovereignty over Diaoyu Dao has solid historical and legal grounds. The evidence provided by the Japanese historian has proved this fact once again. 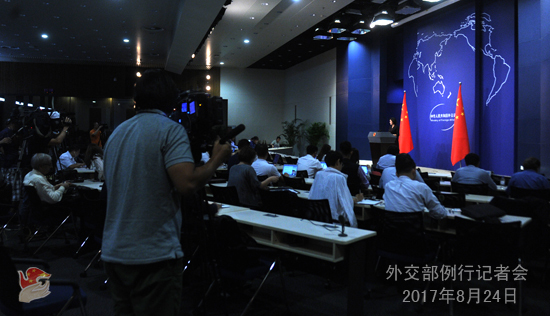 We urge the Japanese side to face the history squarely, respect the fact and properly handle the Diaoyu Dao issue. Q: Could you provide us with more details about the telephone call between State Councilor Yang Jiechi and the US Secretary of State Rex Tillerson? Did they discuss the Korean Peninsula issue and the US sanctions on the Chinese companies in relation to the DPRK? A: Last night, State Councilor Yang Jiechi had a telephone conversation with the US Secretary of State Rex Tillerson upon request and the relevant information has been released. The two sides exchanged views on the current situation in Afghanistan. In addition, with regard to the China-US relations, State Councilor Yang Jiechi said that China and the United States maintain communication and cooperation in a wide range of areas, which serves the interests of the two countries and the world at large. The two sides should, based on the important consensus reached between the two heads of state, step up the high-level exchanges and exchanges at all other levels, ensure the success of the dialogue mechanisms and make a good preparation for President Donald Trump's visit to China at the invitation of President Xi Jinping this year. We hope that the two sides can work in the same direction, follow the principles of mutual respect and mutual benefit, expand cooperation, properly handle differences and jointly uphold the sound momentum of the development of the China-US relations. Secretary of State Rex Tillerson said that the United States is willing to work with China to follow through on the important consensus reached between the two heads of state, enhance communication and cooperation, ensure the success of the first round of the US-China Social and Cultural Dialogue and the US-China Law Enforcement and Cybersecurity Dialogue and move forward the bilateral relations. President Donald Trump is looking forward to his visit to China this year and it is hoped that the two sides can join hands to ensure the success of this visit. As for the specific issues you mentioned, China's positions are consistent and clear-cut and the United States is clear about China's positions. 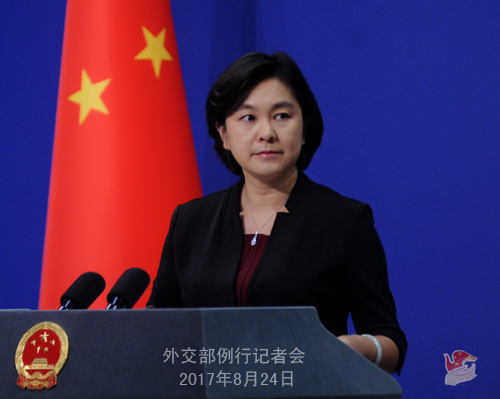 The Chinese side is willing to maintain communication with the United States on the basis of mutual respect. Q: According to the report of Yonhap news agency, on August 23, the ROK President Moon Jae-in chaired the briefing session on the core policies concerning the foreign affairs and unification. While being briefed by the Foreign Ministry, he said that we must try to more actively resolve the Korean Peninsula nuclear issue through close diplomatic cooperation with China, Japan and Russia, as well as the strong ROK-US alliance. The ROK Foreign Minister Kyung-wha Kang said that the ROK will try to peacefully resolve the Korean Peninsula nuclear issue. What is your comment? A: I have read the relevant report and noted that during the last few days, the ROK has explicitly and publicly stated multiple times that the Korean Peninsula nuclear issue should be resolved peacefully. The Chinese side is always committed to properly and peacefully resolving the Korean Peninsula nuclear issue and maintaining the peace and stability of the Peninsula because this serves the common interests of all relevant parties and the international community and is worth the concerted efforts of all relevant parties. We hope that all relevant parties can make unremitting and positive efforts in this direction. Under the current circumstances, all relevant parties should exercise restraint, make decisive resolution, make the right decision which is responsible for their own people and the regional peace and stability and take the right actions that are conducive to easing the tensions and peacefully resolving the Korean Peninsula nuclear issue. Q: The Commander of the US 7th Fleet has been sacked after a number of accidents. What is your comment? A: This belongs to the domestic affairs of the United States. However, I have also noted that there have been many media reports and comments in the last few days. Indeed, many people are very concerned about the harm posed by the frequent activities of the US forces in the relevant waters to the freedom and security of navigation. We hope that the United States can take this issue seriously and properly handle it.